Murphy was born on June 20, 1925 in Texas. His family was extremely poor, partially due to having twelve young mouths to feed. When his father abandoned the family when Audie was fifteen years old, he was forced to pick up some of the slack by hunting and doing what work he could to keep food on the table. Unfortunately, his mother died just a year after his father left. About seven months later, just ten days after he turned seventeen, he tried again. Having gained some weight (getting up to a whopping 112 pounds / 50.8 kg) and with falsified testimony from his sister claiming he was actually 18, this time Audie was able to get into the army. He was then shipped off to North Africa and later deployed to Sicily. Despite his small size, Murphy proved to be a phenomenal soldier. In 1944, after witnessing the death of a friend during Operation Dragoon, he charged a group of German soldiers, took over their machine guns and other weapons, and proceeded to take out the other enemy soldiers within range using their own artillery. He was awarded a Distinguished Service Cross for his actions that day, the first of many medals. During another battle shortly after this, to cover retreating Allied soldiers, he jumped onto a tank that had been hit and was on fire, exposing himself to the advancing enemy soldiers. Why did he put himself in such an exposed position on a tank that could potentially explode at any minute? There was a .50 caliber machine gun on the tank. Despite the leg wound, as soon as he caught up with his retreating soldiers who had now re-formed, he turned them around and managed to reclaim a stretch of forest from German occupation. According to the official report, in that battle, he killed or severely wounding at least fifty German soldiers by himself. For this act of bravery and for “indomitable courage and his refusal to give an inch of ground [saving] his company from possible encirclement and destruction…” he was awarded the U.S. Medal of Honor. He rose through the ranks and was a captain when he was pulled out of the war in 1945. All in all, he earned 33 awards and decorations for his exemplary service during the war. He was just 20 years old at the time and, as one movie critic later put it, knew more of death than he did of life. When Murphy returned from the war, he suffered from post-traumatic stress disorder, a condition that often went undiagnosed at the time. After being featured on the cover of Life magazine, he found himself in Hollywood without work, sleeping in rough conditions. He caught his big break in 1949 when he starred in the film Bad Boy. That same year, he released the aforementioned autobiography titled To Hell and Back, which topped the bestseller charts. He went on to star as himself in a movie with the same title in 1955; it was Universal’s top-grossing film for nearly 20 years until Jaws usurped it. Acting seemed to suit him. He made no less than 44 feature films while he was in Hollywood, many of them westerns, and also filmed a 26-episode western TV series called Whispering Smith, which aired in 1961 on NBC. It was criticised for being too violent, however, and cancelled after just 20 episodes were aired. Yet all was not well with Murphy. Back to his post traumatic stress disorder, he became dependent on sleeping pills to combat the insomnia he experienced after the war. Realizing he had become addicted to them, he locked himself in a motel room for a week, while he worked through the withdrawal symptoms. He ended up beating the addiction and went on to break the taboo of talking about the mental disorders many soldiers suffered when they returned home. His willingness to do so opened up discussions about psychological care for veterans upon their return to the US. Murphy ended up marrying twice, divorcing his first wife after just two years, and having two sons with his second wife. He appeared to be happy with his family, with more than enough money in the bank to keep them comfortable (though he squandered much of it on gambling in his later years); had acted in dozens of movies; and had amazing war stories to tell his grandkids about. Unfortunately, he wasn’t able to get to that stage of his life. On May 28, 1971, Murphy was in a private plane flying on a business trip from Atlanta, Georgia to Martinsville, Virginia. The weather conditions were less than ideal: rain and fog shortened the pilot’s visibility considerably, and he had a questionable instrument rating. He called in to the Roanoke, Virginia airport to say that he would be landing shortly due to poor conditions. The plane, carrying five passengers including Murphy, never landed in the Roanoke Valley. It crashed into Brush Mountain twenty miles away, close to Blacksburg. Everyone in the crash was killed. Murphy was just 45 years old. The site of the crash has since been turned into a monument, and in the 1990s, the Appalachian Trail was rerouted to go past it. That wasn’t quite the end for Murphy, though. After a funeral in Arlington Cemetery, where his grave remains the second most visited (after Kennedy’s), he was posthumously awarded his final medal, the Texas Legislative Medal of Honor. It was presented to his last remaining sister, Nadine Murphy, on October 29, 2013 by Governor Rick Perry. Many biography pages about Murphy incorrectly cite Audie Murphy’s birth year as 1924, which is based on the fake birth certificate that Murphy used so that he could sign up to serve in the army at 17. He admitted to creating a false birthday on many occasions. 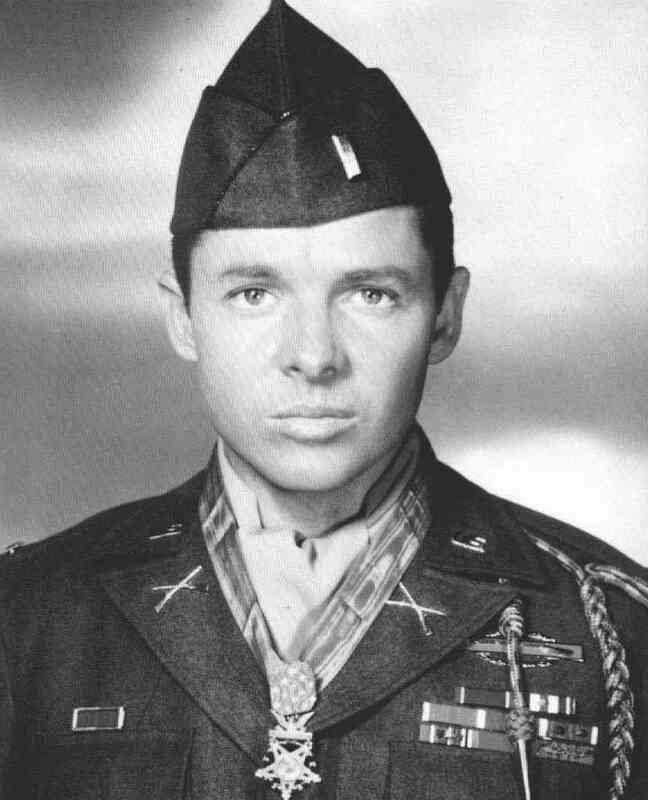 Audie Murphy actually owned his own plane and was a pilot himself, but was not flying the day of his fatal crash. One reference I found indicates Murphy did not reach the rank of Captain until his service with the Texas National Guard in 1950. During the war he had been promoted to First Lieutenant in February 1945. Hats off to the late-great Audie Murphy for his heroic service to this great Nation. He will always be recognized as one of America’s greatest. That still does not diminish his valor. Where is his Grave ? So what happened to rest of the people ??? ?